The month of March has always been a big one for half marathons in the UK, which is no surprise with the Virgin Money London Marathon coming up in April. Runners are spoilt for choice and there are races of all sizes and terrain going on throughout the month. 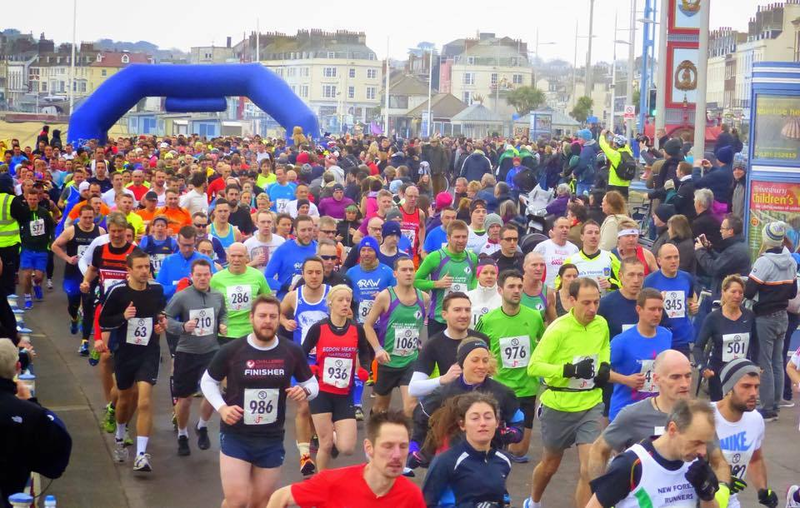 We decided to have a closer look at the Weymouth Half Marathon, which takes place on Weymouth sea front on Sunday 17th March. and will be the fifth running of this event. Found in the county of Dorset on the south coast of England, Weymouth is traditional seaside town with lovely sandy beaches, a historic harbour and rows of colourful beach huts which makes it a popular holiday destination in the summer months. Weymouth is just over 60 miles away from Southampton and is part of the Jurassic coastline which was awarded World Heritage status back in 2001. The seaside town was also home to the London 2012 Olympic and Paralympic Games sailing events. You can find out more about Weymouth and the area from the Visit Dorset website. The event was started back in 2015 by event organisers Just Racing, who had selected Weymouth as a location for a long distance triathlon Challenge Weymouth. This then went on to become part of the IRONMAN series and is now IRONMAN 70.3 Weymouth . 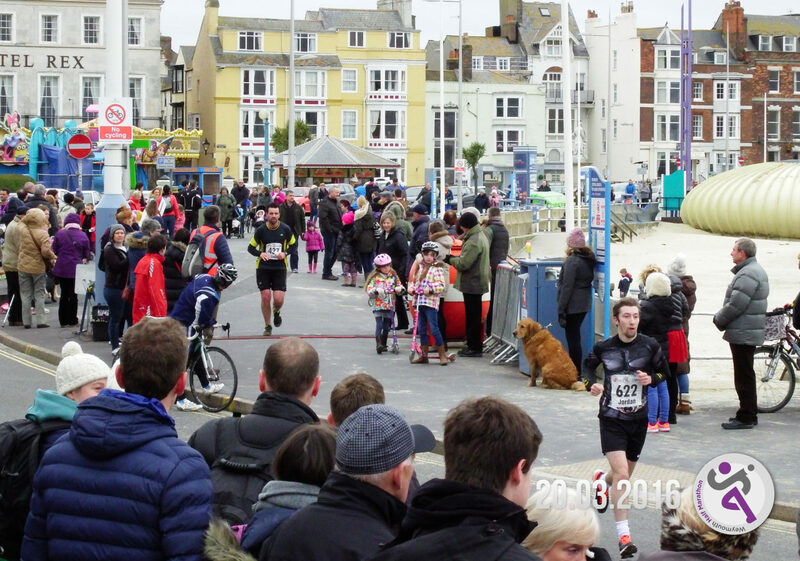 Having worked and delivered many sporting events across the UK Just Racing realised that Weymouth would be a perfect place to hold a picturesque half marathon and big running event of this kind would fit nicely into the local sporting calendar. The event has evolved through the years; for the first two years the race route actually headed into Portland and included an off road section, but that was changed to keep the run in and around Weymouth. The race has grown in numbers and significance over the last few years and now attracts around 1,200 runners each year. 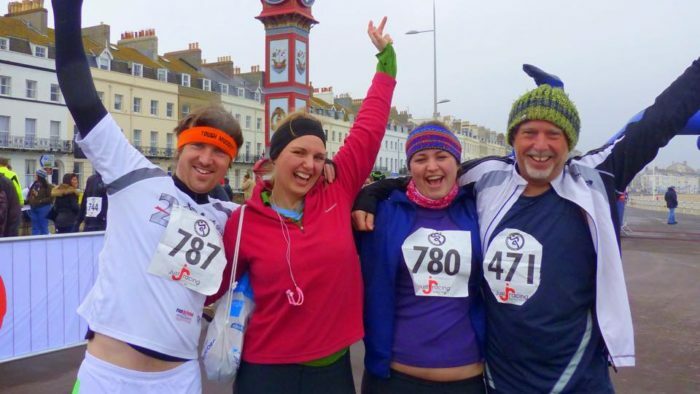 The 2019 event will be the fifth running of the Weymouth Half Marathon. The race starts and finishes outside the Weymouth Pavilion, which sits in between Weymouth Harbour and the beach (the Pavilion is worth a visit and if you fancy a singalong before the run you can you book tickets to see Crocodile Rock on the Friday Night 15th March and/or Beatlemania on the Saturday night 16th March). From the start the route takes runners along the beach front and past the many beach huts, guests houses and hotels that line the sea front. Just after the three mile point runners leave the beach front and enter Lodmoor Country Park for just over a mile and then head back out onto the sea front again, heading back into town and past the Jubilee Clock Tower (built in 1888 to commemorate the Golden jubilee of Queen Victoria it is a well known landmark of Weymouth). Once back into the main shopping area runners then go over a bridge, into the historic harbour and along the coast again, but this time with a stunning view of Portland (where the Olympic sailing took place). It’s from about this point, 7 1/2 miles into the race that the race climbs, though you wouldn’t really call it a hill, it’s more like a couple of bumps! All in all it’s a flat and fast course with great PB potential. If you’re a slower runner or plan on walking it beware that there is a 3 hour cut-off for the event and they enforce a mid-way cut-off too. The organisers award age group prizes in five year bands and there’s chip timing so you can be sure of an accurate official time. You can even take part in the ‘Dorset Double’ and take on the Dorchester Half Marathon on the 19th of May as well. Runners who do both events will be eligible for another medal and age group prizes. There are four water stations through out the race and the finish is on the seafront outside the Weymouth Pavilion. All finishers get a bespoke medal which I believe this year will feature a Jurassic Beast! Weymouth Half undoubtedly has a lot to offer runners but it’s also a great event for spectators! As well as enjoying a morning out at the seaside there are lovely coffee shops and restaurants lining the route, to help fuel your supporters. The seafront finish line is always brimming with a huge amount of enthusiastic support. And at that time of year there’s plenty of accommodation available as well, so why not make it a weekend away for the family? To find out more about the event visit the event website HERE.